Living in the city, we easily forget the basics of survival and the roles of nature and the earth. A swimming pool would seem to be a most unlikely place for a reminder. 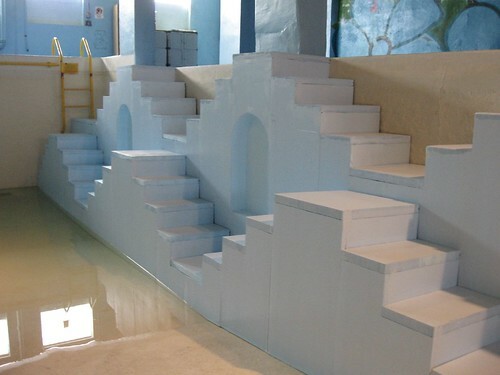 But Andria Bibiloni’s evocative installation Descend in a North Philadelphia empty pool calls up times and places past, our relationship to rivers, our need for water, and our dependence on the good graces of the earth and its bounty. 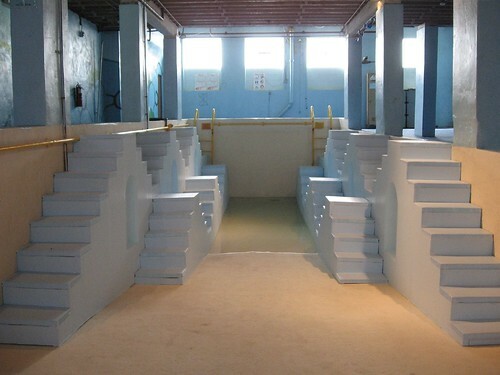 The pool in question, still closed for the season, is at The Lighthouse Community Center at 141 Somerset Street (corner of Howard), a block north of the main Lighthouse building on Lehigh–where Pepon Osorio recreated his Badge of Honor Installation last year (Roberta’s post here). The Lighthouse is in the heart of North Philadelphia’s Puerto Rican community, just a block or two away from Taller Puertorriqueno. I stopped in a Chinese take-out restaurant to ask directions, and the two people there, behind bullet proof glass, had no idea about where the nearby community center was. All they seemed to know was their own address. Their terror was obvious and I rushed away, thinking perhaps I was the cause. Fortunately, a gentleman walking up Somerset was able to help me out. Once I was in the building, the women at the front desk directed me downstairs. I was rather confused by the warren of rooms and the fact that I had to walk through a lavatory. Again, a man along the way reassured me I was going in the right direction. The installation, after all that, was especially welcome and appealing, an oasis of light and peace in the dank concrete depths of the building. 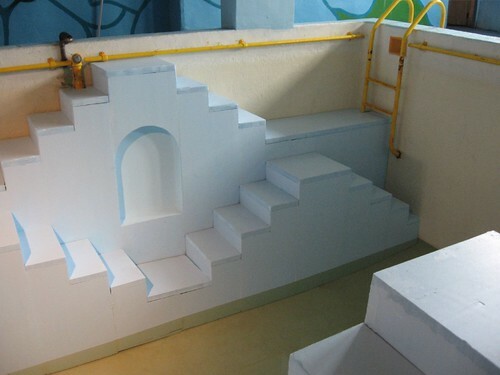 Bibiloni, who is a graduating Tyler MFA and has Puerto Rican roots, said that the steps were inspired by a traditional form of access to water. She is a graduating Tyler MFA and has been working as an assistant to Osorio. We’ve mentioned Bibiloni on the blog before. This post has an image of an earlier piece.